There’s a definite Fall nip in the air, so on this beautiful October Virginia day, I ventured out to (sadly) pull up the dried and moldy zinnias, petunias, and marigolds that, nonetheless, are still trying to bloom their hearts out. But that doesn’t mean I can’t enjoy the colors and beauty of summer flowers throughout the Winter months. Some people rely on the new catalogues that come in by mail and over the Internet. Though they’re great, even more fun are old turn-of-the-century catalogues. So what if they’ve become dog-eared and yellowed? Their bright illustrations still zing off the page. And what better way to learn which flowers and vegetables our grandmothers and great-grandmothers cherished. If your grannies’ catalogues were tossed out long ago, never fear. You can still find these treasures in antique shops, like I did when visiting my son and his family in Ballston Spa, New York, and dropped by one of my favorite antique shops, Stone Soup Antique Gallery. It’s a picturesque deep-red brick building with gleaming wood floors on Low Street, right up from the village square. Lesley Lewis, one of the venders, loves flower ephemera just as much as I do. 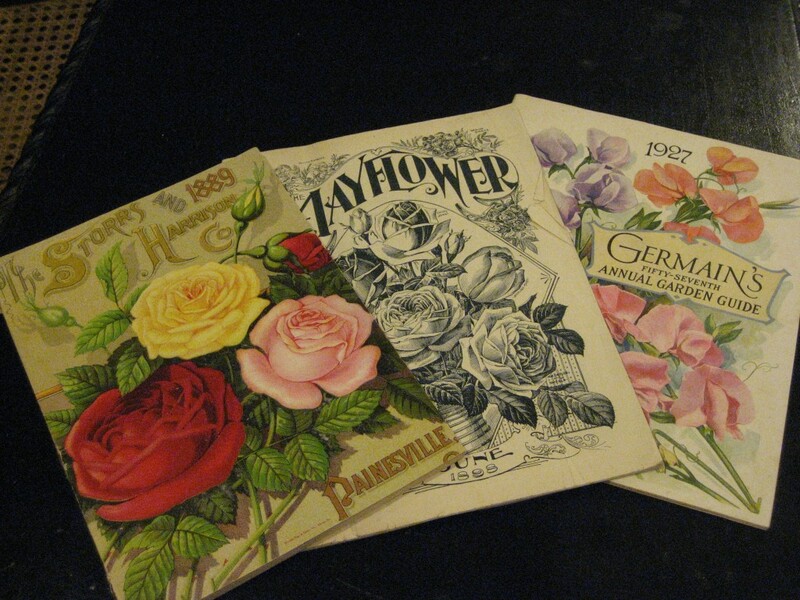 Among her many catalogues were these three from across the country—Storr’s & Harrison, from Painsville, Ohio; Mayflower Gardening Magazine, published in Floral Park, NY; and Germain’s from Los Angeles—priced from $18 to $55. 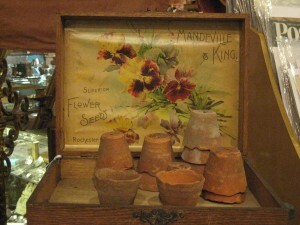 But also catching my eye was the seed box from Mandeville & King, Rochester, NY, with the old terra cotta pots still present, for $185.00. With these constant reminders of Spring and Summer around, Winter has never promised to be so bright and cheery.